Workforce Development unemployment map by county. Iowa’s unemployment rate in September stayed at 2.5% — unchanged from August. Iowa Workforce Development spokesperson Cory Kelly says only Hawaii has a lower jobless rate, which rose to 2.2% last month. “They’d been sitting at 2.1% for a couple of months. Their unemployment rate rose just a bit, while ours held steady at 2.5,” Kelly said. This is the lowest the unemployment rate in Iowa has been since of May of 2000. It’s a job seekers market and, according to Kelly, a very challenging time for Iowa businesses that are trying to hold on to employees.”Normally, when the unemployment rate ticks down you see wages increase, so there’s a lot of competition out there,” Kelly said. 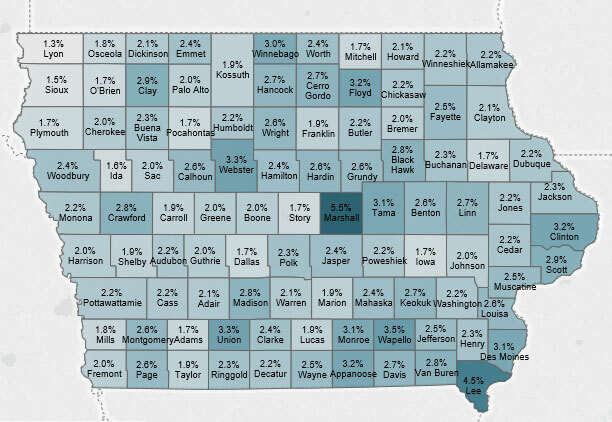 The IWD report shows the total number of working Iowans increased to 1,644,400 in September. That’s 1,900 higher than August. “Total nonfarm employment remains up 17,600 jobs versus last September, so goods-producing sectors continue to fuel annual growth and have contributed 14,300 jobs over the past twelve months,” Kelly said. There were 41,800 Iowans listed as unemployed in September. That’s down from 50,000 one year ago.